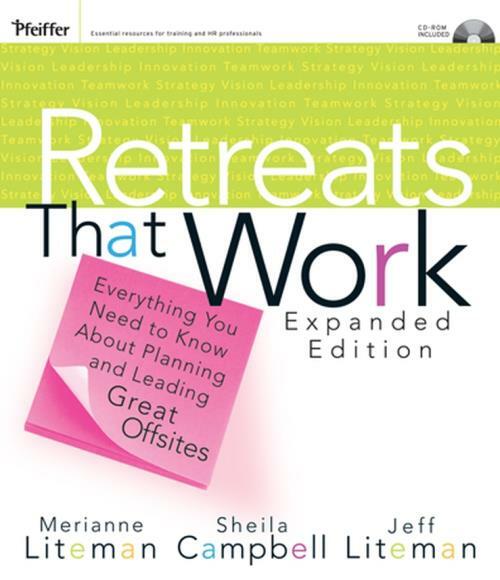 Retreats That Work: Everything You Need to Know About Planning and Leading Great Offsites is a comprehensive handbook for creating offsite retreats that get results and rave reviews from participants. This greatly expanded and updated version is based on the best–selling first edition. It contains forty–seven new activities, more information about how to design and lead retreats, and additional suggestions for how to recover when things go wrong. It also includes a CD–ROM that allows readers to print out chapters for distribution to key leaders, duplicate templates, and produce handouts for specific exercises. Whether you are planning to lead an offsite retreat for the first time or the ninety–ninth time, Retreats That Work is an invaluable, practical, easy–to–use guide, full of step–by–step instructions for leading a wide variety of tested exercises. "The Litemans and Campbell have served up a delightful, wonderfully written, accessible, and invaluable resource book for retreat planners. It is jam–packed with ideas, tools, pitfalls to be avoided, and everything one needs to create Retreats That Work." "What a treasure of valuable tools to facilitate the best darn retreat of your life! Whether you′re new or a veteran, struggling or successful, you must invest in this gem! The authors of the expanded version of this book share everything from pre–retreat preparation to follow?up activities to implementation and design to recovery. It′s all there! Add to that handouts, client material, and templates on a handy CD you′ll think you struck gold!" "For companies organizing a retreat, this should be your bible. It delivers exactly what it says it will: practical approaches that assure effective retreats. Would that other business books were so impressive." Jeffrey LaRiche, chairman and CEO, Castle Worldwide, Inc.
"This book is an impressive and much–needed resource for training and development professionals. I only wish it had been around when I was getting my feet wet in retreats. Having read it, I would never again lead an offsite without referring to it, over and over again!" SECTION ONE: Materials for the Facilitator. Chapter 1: Working with the Client. Nine Reasons to Hold a Retreat. Ten Reasons Not to Hold a Retreat. What If the Client Is Your Boss? Aligning Yourself with the Client. Using a Specialized Retreat Format. Chapter 2: Planning the Retreat. Identifying the Scope of Issues and Creating the Retreat Plan. Who s Who in Planning a Retreat. Involving Participants in Retreat Planning. Deciding Whether to Work with a Co–Facilitator. Creating the Conditions for Success. Chapter 3: Retreat Design Issues. Sins of Omission: The Top Retreat Design Mistakes. Design Issues for a Series of Retreats. Chapter 4: Retreat Design Components. Chapter 5: Structuring the Retreat. Chapter 6: Leading the Retreat. When Should the Facilitator Intervene? Giving Feedback to Retreat Participants. Chapter 7: How to Recover When Things Go Awry. A Few Participants Dominate the Discussions. The Group Keeps Wandering off Task. The Group s Energy Is Flagging. A Participant Keeps Plowing the Same Ground. A Participant Repeatedly Disrupts the Conversations. The Participants Refuse to Deal with Important Issues. A Senior Manager Violates the Ground Rules. A Participant Is Overtly Hostile or Refuses to Participate. I m Outta Here : A Participant Walks Out. A Participant Gets Furious or Defensive or Bursts into Tears. Participants Are Turning the Retreat into a Gripe Session. Participants Are Resisting New Ideas. An Intense Conflict Breaks Out. A Participant Breaches Another s Confidence. The Group Is Resisting You. Chapter 8: Helping Participants Make Decisions and Plan for Action. Activity: Let s Take Our Chances. Activity: Our Stable of Clients or Resources. Activity: Show Me Our Future. Chapter 9: Leading a Strategic Planning Retreat. Discerning the Organization s Values. Activity: Glimpses into the Future. Chapter 10: Leading a Culture Change Retreat. Great Expectations: What Can Realistically Be Accomplished at a Retreat. Activity: Timeline of Our History. Working with Sensitive or Controversial Issues. Reward Structures Help Shape Culture. Activity: What Gets Rewarded Here? How Individuals Foster Culture Change. Activity: We ll Keep . . . .
Recognizing and Removing Obstacles to Change. Chapter 11: Leading a Team–Building Retreat. If You re Asked to Lead a Team–Building Retreat. Characteristics of a Productive Team. Activity: Are We Dropping the Ball? Activity: Wouldn t It Be Great If . . . ? Exploring How Things Are and How Participants Would Like Them to Be. Activity: Vehicle for Change I.
Clarifying Individuals Roles and Responsibilities. Activity: This Could Be Me. Exploring the Importance of Feedback. Activity: How Do I Contribute? Probing for Sources of Conflict. Activity: How Conflict Affects Us. Exploring How Individuals Can Change Their Own Behaviors. Activity: Incident at Coyote Canyon. Chapter 12: Leading a Creativity and Innovation Retreat. Preparing Participants to Think Creatively. Activity: How Would I Use It? Activity: It′s Music to My Ears. Activity: Reporters from Planet Arimira. Activity: Put on Your Thinking Cap. Activity: I Want Those Resources! Chapter 14: Closing the Retreat and Working on Implementation. Summing Up and Preparing to Follow Through. Activity: What I See for Me . . . .
Activity: Vehicle for Change II. Activity: The Road We ve Traveled. Activity: I m Committing . . . .
Activity: You Can Count on Me. What s Your Role After the Retreat? What s Next for You? SECTION TWO: Materials for the Client. Chapter 15: Working with the Facilitator to Plan the Retreat. Last Things First: What Do You Want to Be Different? Your Role and the Facilitator s Role. Chapter 16: Your Role at the Retreat. Reaching an Understanding About Participants Authority. Leadership Behavior During the Retreat. Chapter 17: Keeping the Work of the Retreat Alive. The Role of Senior Management. Activities to Use in Any Retreat. Activities for Culture Change, Team–Building, and Board Retreats. Activities for Building Cooperation and Dealing with Sensitive Issues. Activities for Making Decisions, Planning, and Evaluating Ideas. How to Use the CD–ROM.